So, I have a feeling that my opinion of this book places me in the minority, but, well, I just didn’t like it. In the middle of NaNoWriMo, I had an idea that I wanted to try my hand at penning a zombie novel. The only problem being that I had never actually READ a zombie book. The only zombie “experience” that I had were film and television shows. From all of the web searching that I performed, however, I discovered that there aren’t too many good ones out there. 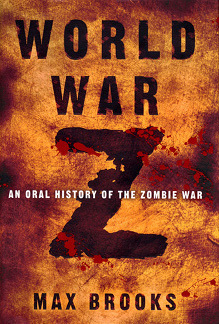 One title that kept coming up, and coming up with mostly good reviews, was World War Z. I’m not entirely sure what I was expecting going into it, but what I wound up reading really wasn’t it. When it comes to zombie apocalypse stories, I like the story to be told primarily from the POV from every day people just trying to survive. I like the story to be gritty, gruesome, and almost entirely hopeless for humanity. I can’t tell you why, but I do. And I promise that I’m not a sociopath — misanthropic, at times, yes…. sociopath, no. While this book included the gritty, gruesome, and hopeless moments, I felt too bored by the sections focusing on the military and political leaders. I just couldn’t get into them. At all. The interview format was a plus, however. For me, it made the sections that I wasn’t too keen on a little less painful to read. I’m a big fan of vignettes, as well, so, essentially, to me, this book was a series of vignettes exposed through the medium of interviews. This leaves me to say that while World War Z wasn’t my LEAST FAVORITE book that I’ve ever read (that prize goes to… yup, you guessed it – The Scarlet Letter), I was really rather disappointed by it. But, don’t take my word for it. Most people love this book. Check it out on Amazon.